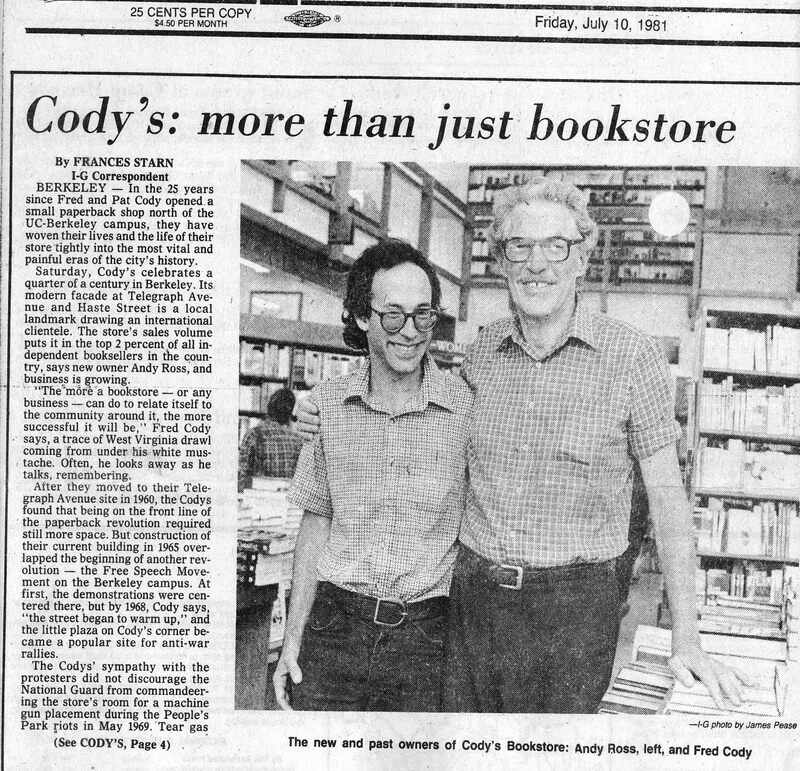 When I became the owner of Cody’s in 1977, it was primarily stocked paperbacks. Although the idea of a paperback bookstore was novel, paperbacks had been around for a long time, at least since the mid 19th century. The first strictly paperback publisher was Pocket Books, founded in 1939. Its famous logo of Gertrude the kangaroo is still on the spines of Pocket Book titles. The company is now an imprint of Simon and Schuster. The first title they published was Lost Horizons by James Hilton. New paperback publishers started popping up in the 1940’s. Penguin Books, Bantam, New American Library, and Ballantine Books still live on today as imprints of larger houses. The books they published were called “mass market” paperbacks. They were and continue to be rack sized books and were primarily sold outside of the traditional book channels. Mostly you found them in magazine outlets and drug stores. In the 1950s publishers started producing “trade paperback” books. These were of a larger format and were usually sold in the new paperback oriented bookstores like Cody’s and Keplers. Before the mid-1970’s, booksellers couldn’t buy mass market books direct. 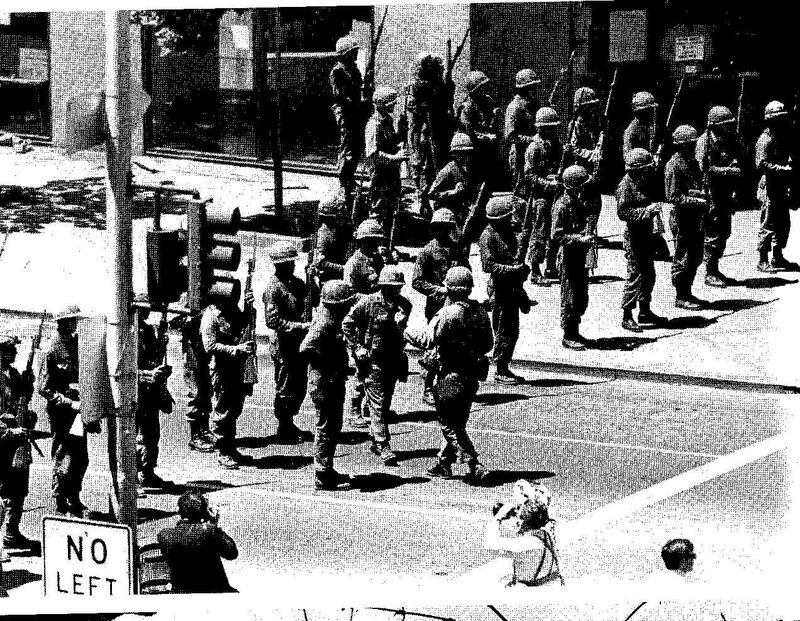 They were forced to buy them from local magazine distributors with unfavorable trade terms and limited selection. A lot of these distributors were run by the mob, who kept both the bookseller and the publisher in a state of terror. Gradually publishers started showing some uncharacteristic backbone and began selling direct to booksellers. 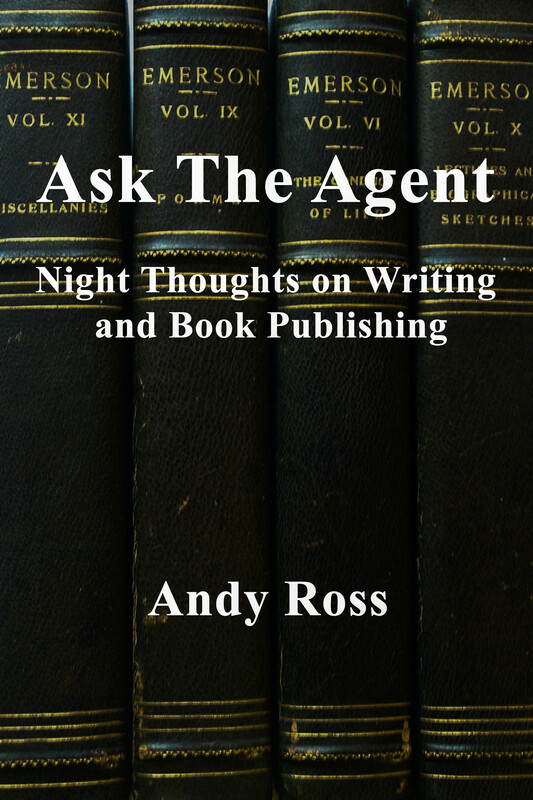 There were a number of reports of “representatives” from the magazine distributors, goons really, making personal visits to booksellers in order to discourage them from dealing directly with the publishers. But the booksellers (who were mostly small shopkeepers back then) showed their characteristic courage and independence that continues to be their hallmark to this day. Fred Cody told the story of a visit from one of these representatives who threatened to break his knees. Although the mass market publishers sold reprints of hardback bestsellers, they really excelled at genre fiction. That still is their long suit today. Genre fiction is a publishing term of art for mysteries, science fiction, fantasy, westerns, thrillers and romance. A lot of the stuff was pretty cheesy. The covers in those days were wonderful — full of babes in suggestive poses, their bodacious bodies pouring out of their skimpy clothes. Titles like Flesh Pots of Malibu. Some nice lesbian action too, mostly taking place in ladies’ prison blocks. My favorite genre back in the 70s were the romances which we called “bodice rippers” referring to the formulaic schlock-o covers of shirtless muscle men and swashbucklers ripping the bodices off the swooning, usually excessively endowed, heroine. I remember every year at the booksellers convention, the romance publishers would hire big hunks, usually dressed up as pirates to promote the titles. There were also women at the booths who all looked like a cross between Scarlett O’Hara and Daisy Mae Yokum. The most popular and probably the most tasteless title in this genre was one called: Mandingo. It had a a larger than life slave with bulging muscles popping out of his tattered clothes along with the daughter of the slave master, ripped bodice and all, swooning at his feet. In 1977 Cody’s was a large store for its time. It was about 8900 square feet. That’s not impressive compared to the giant superstores around the country now that are sometimes as large as 60,000 square feet. It always seemed a lot larger though. The Codys had built this structure themselves in 1963. The main room was 35 feet high with floor to ceiling windows giving it a cathedral-like feeling of space. It was filled up with funky homemade pine bookshelves sagging with spine out paperbacks. It was pretty impressive when you walked into the store. It looked like it had every book ever published. When I bought the store, there were only 17 employees. But that was an enormous change for me. I had previously only managed one or two people at any given time. The staff were paid $3.25 per hour. Pat Cody always said that the employees had to settle for the psychic compensation of being surrounded by books. It was true that most of the employees were hired because they, too, had a passion for books. 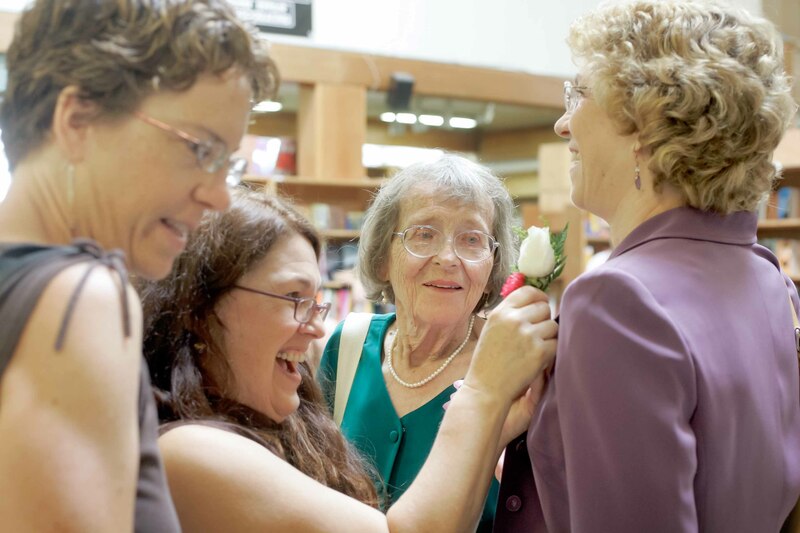 I was fortunate to have two managers who were experienced, competent and gifted booksellers. The general manager was Nick Setka. He was 27 years old then and did most of the buying for the store, which was perfect for his wonderful, intuitive understanding of books. Ed Manegold, then in his early 30’s, was the assistant manager. He was smart, committed, and much more tough minded than either Nick or me. Outside of finding the right book for a customer, buying was the only fun job in bookselling. So I tried to join in on that. Usually Nick and I would sit down together with the salesmen. Back then the sales reps were known with the rather quaint name of: “travelers.” Nick is still in the book business. He is a manager at Book Passage in Marin County and works there with my wife, Leslie Berkler. 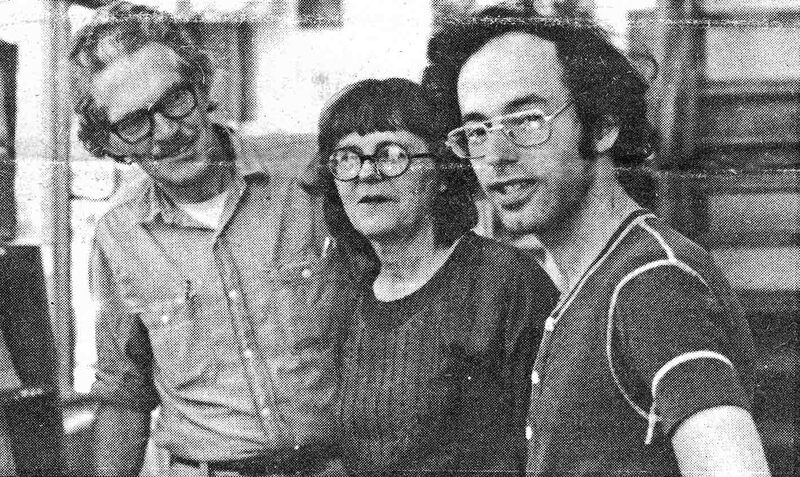 In 1977, the store was organized and stocked in a way that reflected the passions of the owners, Pat and Fred. The front table, the most prominent real estate in the store, was filled with self-published and small press books. Fred believed in small presses with a passion. It was a kind of political position. He once made a public statement that he would stock one copy of any small press book that was offered to him. That statement came back to haunt him, but it tells a lot about Fred’s passion as a bookseller. I was less thrilled with the small presses. A lot of those books seemed to be solipsistic exercises. But still times were different then and there really were some phenomenal small presses, many of which were located in the Bay Area. Some of them still exist today. City Lights Books in San Francisco started its publishing arm in 1955. It most famously published Allen Ginsberg’s Howl the following year. Over in Berkeley Phil Wood gave up his sales rep job at Penguin and decided to start publishing. His first book, Anybody’s Bike Book, inspired the name for his new publishing company, Ten Speed Press. The book went on to sell a million copies, and Ten Speed Press still exists today. In 2009 it was bought by Random House and continues to be an imprint there. Phil died in 2010 after a long bout with cancer. He was a legend and a reminder of a time when publishing was a more personal endeavor driven by people with a passion for books. I admired Phil tremendously throughout his career and will miss him. I miss him a lot. Here is a list of the bestselling titles of 1977, the year I bought Cody’s. Not such a bad list of titles, all things considered. The really hot books at Cody’s were quite a bit different though. Yes, we sold bunches of Carlos Castaneda, Tolkien, and Alex Haley’s Roots. And even a few of the less memorable titles on the list like James Herriot, Erma Bombeck and The Thorn Birds. But Cody’s was really marching to the beat of a different drummer. We would sell hundreds, even thousands, of books like Of Grammatology by Jacques Derrida, The History of Sexuality by Michel Foucault, Anti-Oedipus by Gilles Deleuze and Ecrits by Jacques Lacan. (And almost anything else by French philosophers and considered “post modern”). These books were all written with such opaque jargon that they could only be understood, if at all, by those initiated into mysteries of the cult of deconstruction. To the cognoscenti, these books were nothing less than a redefinition of philosophy and literary theory. For the rest of us, it seemed like fashionable nonsense. Radical politics was still a passion in those days and was reflected in the books available in the store. Herbert Marcuse’s One Dimensional Man had inspired a generation of radical students since its publication in 1964. Cody’s had two cases of books on “Marxism”. Aside from the collected works of the master and his major disciples, Lenin, Mao, and Gramschi, we sold a lot of the contemporary Marxist thinkers. Perhaps the most popular of the new Marxists was Louis Althusser, another French scholar. He was considered a “structuralist” which I guess gave him a license to write the obligatory impenetrable prose. In 1980 he strangled his wife to death. But this did not seem to have harmed his reputation as a brilliant intellectual. His fans spent a lot of time spinning out strained arguments about why we should distinguish between the profundity of his ideas and the fact that in life he was a homicidal psychopath. They should have just accepted it as an embarrassment and left it at that. Scholars and philosophers like Jürgen Habermas, Hannah Arendt, Fernand Braudel, Claude Levi-Strauss, Jean Piaget, and Walter Benjamin sold well at Cody’s over the years. At one point, Cody’s was selling 10% of the national sales of Walter Benjamin’s classic work of literary criticism, Illuminations. In contrast to the two cases of books on Marxism, the six cases on philosophy and the ten cases on criticism and literary theory, we only had one shelf of books on business, half of which was taken up by a single title, What Color is your Parachute? The world changes and bookstores reflect those changes. As we moved into the 21st century, the business section had increased to about 20 cases including subsections on management, sales, real estate, and investing. Marxism became a kind of an intellectual footnote, of importance only to the history of ideas. Most of the titles in the Marxism section quietly went out of print or stopped selling. And we folded up the section and incorporated the few remaining titles into politics, history, and philosophy. Cody’s maintained its reputation as a great venue for scholarly titles until the very end. One of the saddest moments in my career was in early 2006. Unlike most retailers who put excess inventory on sale, bookstores can return books that are no longer selling to publishers. We did this almost daily based on lists that were kicked out by the computer of titles with no sales for the previous nine months. I was pulling returns that day and noticed that on the returns list was our last copy of Kant’s Critique of Pure Reason. I was stunned to think that I was taking the most important work of modern philosophy out of the store, but it hadn’t sold in over a year. I left it on the shelf anyway. But that was when I realized that our time was up. Six months later we closed the Telegraph Avenue store. 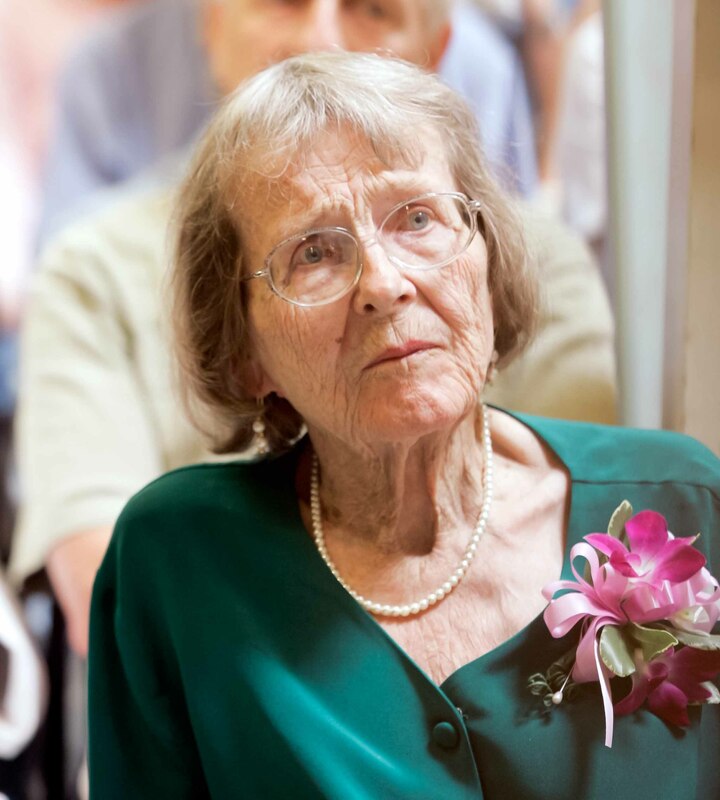 I just learned that Pat Cody died peacefully in her sleep on September 30. 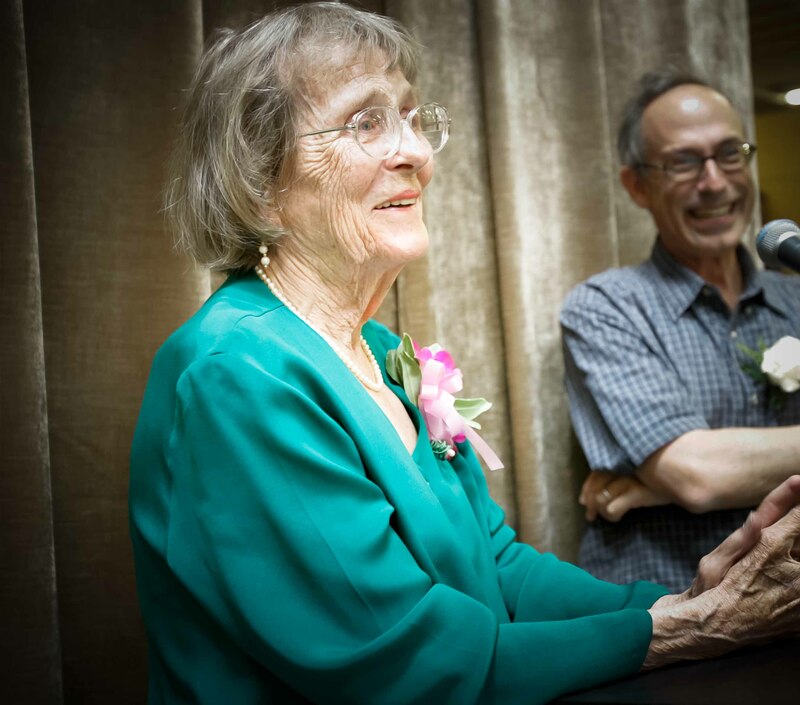 Pat was a remarkable woman who inspired me during my 30 years at Cody’s. 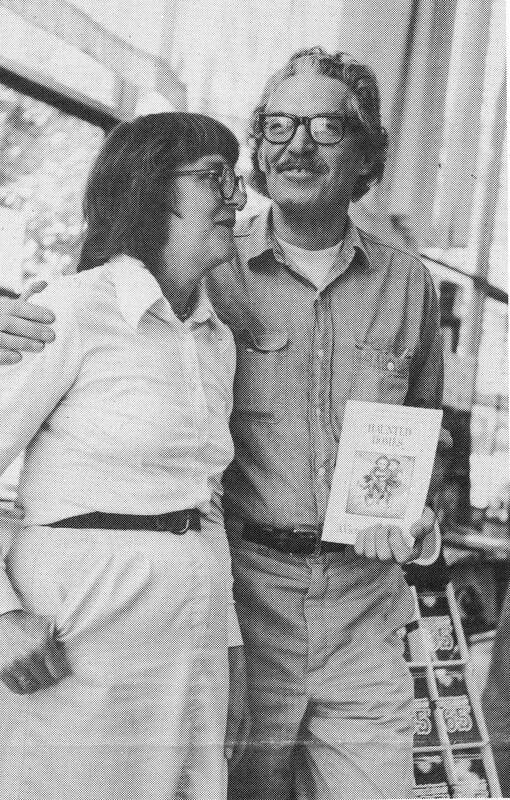 Pat and Fred Cody founded the store in 1956. Fred was an incredibly charismatic man and a visionary. But it was Pat who conducted most of the hard business at the store. Pat always thought of herself as a tough minded business person. She used to say that she learned it from studying at the London School of Economics. But I think she would have been pretty shrewd even without that advanced degree. When I bought the store from the Cody’s in 1977, I was 30 years old and didn’t know all that much. Pat was always available for advice, but was extremely sensitive about imposing her ideas on me. She usually said that it was my store now, and I should run it my way. But she was always there for Cody’s milestone events. I made the decision to close the Telegraph store in the spring of 2006. (The last day of business for the store was July 10 of that year, a day after Cody’s 50th birthday). Everything happening at that time was hard for me, but the hardest thing was having to tell Pat that the store would be closing. I’d been in the book business long enough not to have to seek Pat’s approval. After all, I had owned the store many years longer than the Cody’s had owned it. I was older than Pat was at the time that she left Cody’s. But when I called her, I felt like a kid who had just cracked up the family car. When I told her we were closing, Pat was silent for about two seconds. (It felt like an hour.). And then she said: “It’s remarkable you were able to keep it going as long as you did.” Typical of Pat, this was not a ponderous pronouncement about Cody’s place in history. It was a very commonplace observation. But it was the one thing that I needed to hear at that time. And it gave me a feeling of consolation. That was a very important moment for me. And characteristic of Pat’s decency. After Cody’s closed in June, 2008 Pat had a party at her house for Cody’s employees. About 30 of us showed up. We sat around in Pat’s back yard. We told a few stories about old times, but mostly we just hung out drinking beer like old friends who had once shared something important in our lives. I remember that it was a nice afternoon. Leslie and I will think good thoughts about Pat. We offer condolences to her children: Anthony, Nora, Celia, and Martha. There will be a memorial service for Pat at the First Congregational Church in Berkeley on October 30 at 2:00. Here are some photographs of Pat. This is a picture of Pat and Fred at the store. It appears to be from the early 70s. Pat and Fred with me at the time I became the owner in 1977. Pat at Cody’s Fiftieth Birthday celebration in 2006. It was a bitter-sweet event. Cody’s on Telegraph was closing the following day.